Javier 'Chicharito' Hernandez has told bundesliga.com he is happy to stay in the Bundesliga and aims to fire Bayer 04 Leverkusen to a top-four finish this season. 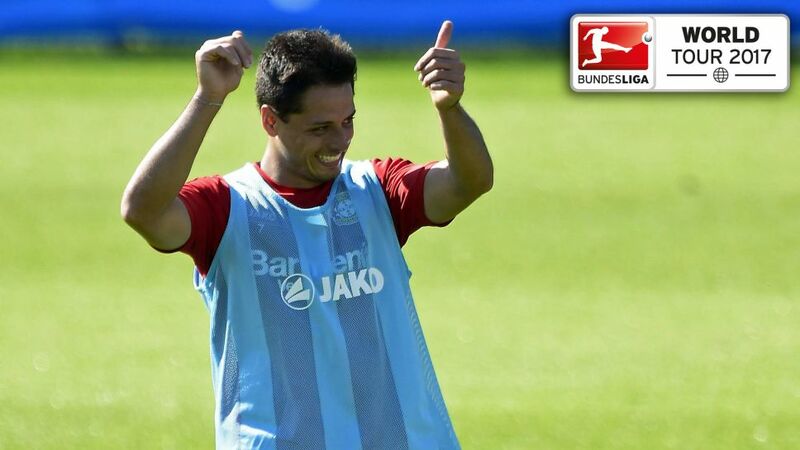 Pop 'Little Pea' into your Official Fantasy Bundesliga team - click here to enjoy unlimited transfers! Roger Schmidt's men still have European ambitions to fulfil this season as Leverkusen meet Club Atletico de Madrid in the Last 16 of the UEFA Champions League next month. The team currently languish in ninth place in , eight points off a place in the top four that would bring qualification for European club football's premier competition once again. Despite the sizeable deficit, 'Chicharito' insisted he can be counted on to help the team climb the table and earn themselves a place among the continent's elite. "Why would I like to stay in the Bundesliga? Because I feel good and I'm happy. I've learned a lot in the Bundesliga, as a player and as a man," said the Mexico international, who joined Die Werkself from Manchester United two years ago, ahead of Sunday's opening Florida Cup 2017 game. "I like playing in the Champions League, and luckily Bayer have been involved in the last few years. We hope we can achieve that goal again in the second half of the season." Watch: more from our exclusive interview with 'Chicharito' in the video below.